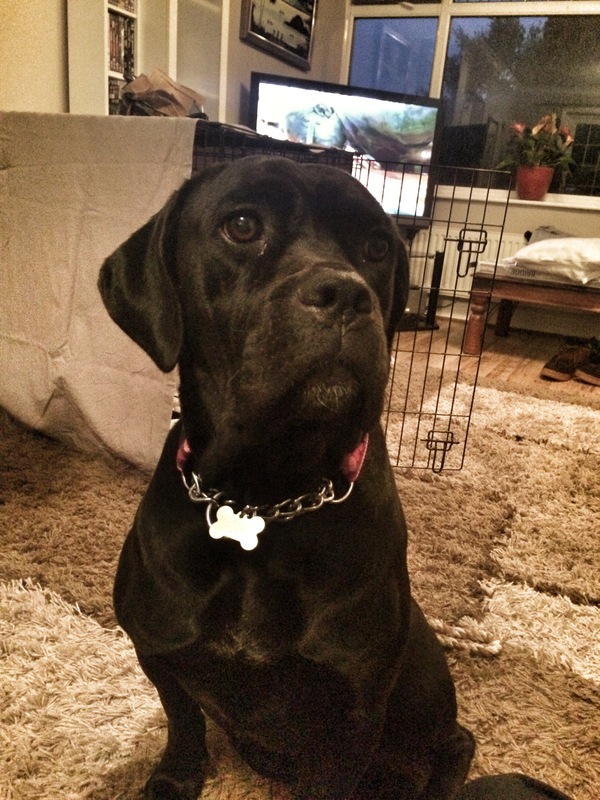 Lola the Rescue Cane Corso, her story so far . . - It's a Blog ! Not a Log ! Lola the Rescue Cane Corso, her story so far . .
Well where do I begin with Lola’s story . .
What we know so far about her is that she was originally owned by a family who originally purchased her from a breeder in France as company for their male Corso, unfortunately for Lola it seems that they didn’t think about the birds and the bee’s when they put them together and at the tender age of 9 months’ when she should have used her remaining puppy fat to have a growth spurt, she ended up in pup and produced 11 puppies and all that goodness that was intended for her, went to her puppies instead. If that wasn’t enough it seems that she was still being taken on very long walks while she was heavily in pup, on top of this at some point in her early life, she also suffered a strain/injury to one of her back legs, requiring surgery, so Lola wasn’t having the normal sort of life you’d expect a young pup to have. Shortly after she had the pups the family relocated to the countryside and it was at this point Lola’s life should have gotten better or so you would have thought, but alas it seems as though it just got worse. Cane Corso’s are not just a Guard/Hunting dog, they are also a companion dog, they thrive on the company of their owners, they bond with an owner like no other breed I’ve met, our previous Cane Corso Blue, used to follow us about the house all the time, she sit and stare in the direction one of us went if we went out and would stay looking that way until we either came back or the other one of us led her on her way, Lola’s is starting to have some of the same habits after only 3 weeks with us, she follows Mel around the house and as soon as I get home, she appears by my side as if by magic. Now Lola’s life before us seem’s to have been nothing like this, she seems not to have been allowed to bond and follow her owners about and get company and love, she seems instead to have been left to run wild with the male across the rather large country property the family owned. The only socialization seems to have been with the kid’s, who from what I can gather treated her as a toy and nothing more, this has obviously lead to a few issues with her that we are slowly working out, these being not socialized with other dogs, not socialized with crowds/large groups and not crate trained, thankfully the crated training has taken and she’s more than happy to sneak away if everything gets too much for her and chill in her crate. The dog socialization is moving forward slowly but surely and she’s slowly getting to know all the dog’s on the field and letting them have a good sniff of her while she gets to know their smells, people socialization is also moving forward slowly, she’s still very nervous when people come to say hello, but that soon disappears if they have a treat to give her first, we’ve also started to take her to our local bars after her weekend dog walks in Chorlton and she quite happily sits under the table and occasionally falls asleep while we have our breakfast/lunch/coffee etc, doesn’t seem to fussed with the hustle and bushel of the bar as long as she got a table and somewhere to lay down. So as you can see Lola’s getting a loving home life now that she surely deserves and we are more than happy to give her with, it’s still early days yet and there’s a lot more of Lola still to come out in the open, so it’s now just a case of being patient and watching her develop into a beautiful Cane Coros albeit it a very small one, though we are hoping that the diet she’s on now and the fact she may still have another growth spurt might just give her a bit more size and stature. Just want to say thanks to Lulu and Shirley of the Cane Corso UK and Molosser Rescue who do a fantastic job for the unwanted/unloved Cane Corso and Molosser in the UK and especially for trusting us with Lola’s future and well-being, we promise to take care of her and love her as much as she’s going to love us. This entry was posted in Cane Corso, Daily Post, Lola and tagged AFTER, Age, ALSO, back, Bar, Bars, Beautiful, breed, breeder, Cane, cane corso, Care, chill, chorlton, Clicking, company, Corso, country, countryside, crate, diet, dog, Family, Fat, field, France, Happy, home, house, job, Left, life, Lola, love, May, Mel, Molosser, Normal, owner, people, puppies, puppy, Rescue, sniff, socialisation, story, toy, training, treat, UK, walks, weekend, Wild, Working. Bookmark the permalink.